Dental implants are an ideal option for people in good general oral health who have lost one or more teeth to periodontal disease, an injury, or some other reason. With a dental implant you can chew normally, smile with confidence, and care for your mouth and teeth just the way you always have. An ideal alternative to bridges, a dental implant can actually replace teeth without compromising the quality of bordering teeth. Dental implants are an artificial tooth root, or titanium fitting, that is surgically secured to the jawbone that look and feel like real teeth, and prevents bone loss and gum recession at the same time. 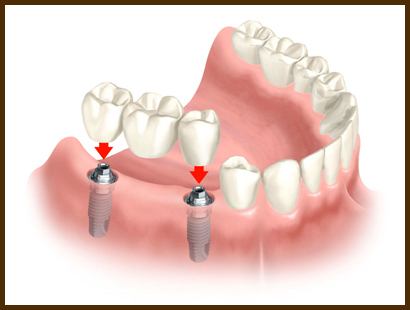 In this procedure, a small titanium post is surgically implanted into the bone and allowed to set for 3-6 months. The bone grows around it forming a tight connection, which additionally slows or stops the bone loss that occurs when the root of a natural tooth is missing. Once the implant is firmly set in the mouth, the dentist then works to attach the replacement tooth onto the top of the post. Your replacement tooth will work and look the same as your natural ones.